When I thought about taking the step from writing as a hobby to a commitment toward publication, I didn’t dream of glamour, money, or having a cardboard replica of me and my bestseller at Barnes and Noble. No, I had one fantasy. I would be part of a Christmas collection. Earlier in my journey, I thought it was happening, and it fell through. After awhile, I had enough on my plate I figured it wasn’t meant to be. 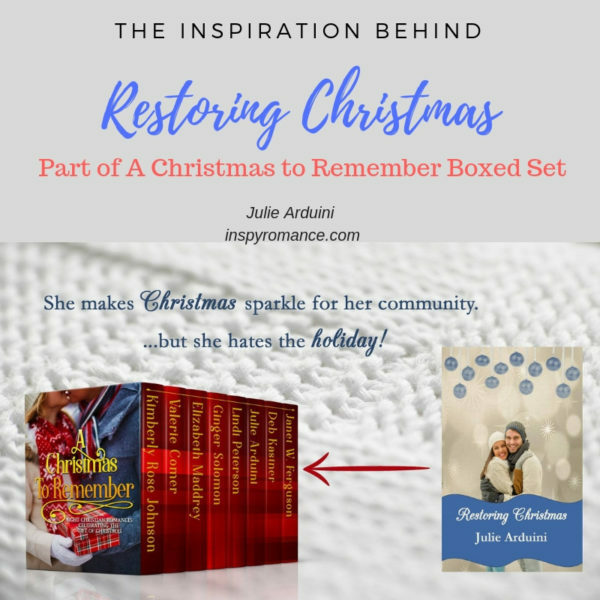 Late last year, Kimberly Rose Johnson asked the Inspy Romance authors if they would be interested in participating in a Christmas boxed set. Even better, I had just visited a magical place that set my holly-jolly heart into Christmas overdrive. The place is called Castle Noel in Medina, Ohio. My son and I weren’t sure what to expect, but one step inside and we knew we were in for a treat. From the gift shop to the tour full of decorations, celebrity Christmas photos, movie props, big store window displays, to the slide down the actual slide Ralphie used after Santa told him he’d shoot his eye out in A Christmas Story, my senses flooded with Christmas ideas. Gifts. Memories. Movie trivia. A story idea. What if you had to work at a place like Castle Noel and you hated Christmas? The idea kept me busy as I drove home and thought of different scenarios. The heroine would be the wounded soul who took her grief out on Christmas. Would the hero be a co worker? A boss? A tourist? It was fun to keep thinking about it when I couldn’t sleep or I was daydreaming. When I knew the Christmas project was a go and I was part of it, the daydreaming became serious plotting. The rest shaped up truly from prayer. The hero, Kevin Holt, had his own pain. A special ed teacher, he enters The Christmas Mansion as part of a class project. The students have minor challenges, but one student creates big problems when he meets Holly Christmas, the co owner with a broken heart. The student discerns that Holly hates Christmas. This story was fun to write, and the feedback I received from those who have read my other books knew it. I was also able to showcase another Upstate NY setting for readers. Geneseo Valley is fictional, but the other towns and some of the establishments mentioned are part of my college years at the State University of New York at Geneseo. The college group that agrees to help Holly is similar to a class I took years ago and learned so much about regarding publicity. I also used some of the setup I remembered from Elmira, New York’s The Christmas House in the story as well when it came to collections. Restoring Christmas is just one of eight novellas readers will be treated to when ordering A Christmas to Remember. I can’t think of a better way to prepare for the season than reading these stories. I’d love to give YOU a chance to win a copy. Leave a comment about a favorite Christmas memory and I’ll choose one random winner to receive a copy through Amazon gift. By the way, I encourage you to check out the pictures at Castle Noel. They inspired me, and I think they will you, too! Hi Julie, how exciting that you get to be part of such a great set- and fulfil a dream:) Your story is great, I like the premise!! Favourite Christmas memory- from the many, the time my husband and I spent Christmas hiking in Tasmania. Christmas dinner was packed in our backpacks and eaten at a beautiful lookout over the coast, before we hiked down to the beach. We are blessed with warm Christmas’ here in Australia, I love being able to head to the beach with family at Christmas. Thank you, Wemble! I LOVE your Christmas memory. That sounds like it belongs in a book! Hi Julie! Your story Restoring Christmas gripped my heart. As a retired teacher, I enjoyed how two groups of students helped at the Christmas Mansion. I can identify with the setting of Christmas year around. In the 1970s for 3 years I worked as a buyer’s assistant to the Christmas buyer, who purchased everything Christmas for 300 Michigan Spartan Stores. This was a year around process, which started with the Toy Show in New York City in February and ended the following January as we reviewed the previous year – from what products sold to delivery problems. Enjoyed all the stories in the boxed set. No need to include me in the drawing. Not sure I have a favorite Christmas memory, but several memorable ones due to illness or loss. Christmas 1968 when both my parents were ill with the Hong Kong flu. Christmas after our house fire in 1997 or Christmas after loosing my mom (age 86) in 2007. Some how God helped us remember The Reason for the Season. Your job sounds like so many of the displays I was able to see at Castle Noel. They were beautiful. A buyer sounds like a fun job, especially for Christmas items. I too have sad Christmas memories. My prayer is God give you fantastic Christmas experiences that gives you extra cause to rejoice. How fun! I have customers in Medina, I will have to ask them about this place! Thank you for sharing!! I had so much fun there. It was a magical place. Thanks for reading! What an exciting box set of books! Can’t wait to read them! That’s a wonderful memory! I love that. I think you will enjoy the set. Perfect to put you in the Christmas mood! I’m so glad you’re getting to fulfill your dream, Julie. Sounds like an interesting story. I don’t know… a cardboard cut-out would really impress the grandchildren! My favorite Christmas memories are the ones we spent 30 years ago in rural Germany, an area clinging to church traditions. They were amazing because of the cultural experience, but we also missed our extended families very much. My mom’s family is German and you’re right, they have so many traditions. I’d love to win Restoring Christmas. The premise of your story sounds interesting and the setting is intriguing. I can’t think of one Christmas memory that stands out, but I do love having the family together. Family is such a great part of celebrating Christmas. Sounds like a fun concept for your story. Not a favorite Xmas memory as such – but I recall loving wandering through the Bronner’s shop in Frankenmuth MI on a family trip as a child – and should really try to get back that way one of these years. As a Michigander Bronners / Framkenmuth is a slice of Christmas in Germany in the USA. The Silent Night Chapel with all the translations of the Carol is my favorite spot. This year is special because the Carol Silent Night is 200 years old. Bronners is selling a commerative ornament. I used to book tours as fundraising for senior citizens and I remember Frankenmuth always sold well. I’d love to visit there one day. One year for Christmas, when I was a child, we went to stay with cousins. I was amazed the next morning because every year their father would stay up all night and weave these webs of yarn and string around the house. One end began at our door with our name on it and at the other end was a present. But, there were 4 of them and the 2 of us so the house was covered with string – some of it even went out the cat door. It took us some time to wind our string up and make it to our present. But what a fun memory (but I valued sleep too much to ever do that for my children!)! That is so fun! What an undertaking that had to be. Like you, I love the sound of it, but losing sleep to do it, I’m not up for that! Julie, my favorite memory is caroling with our Sunday School kids in care homes! We brought so much joy to them, it was a blessing for them and for us! That is a beautiful memory. Thank you for sharing it!